This is a stack of 4 images taken over a 5 day period. If you look to the bottom of the frame, you will see 4 dots - red, green, blue and yellow, each representing Pluto on a different night. Three look regularly spaced with the red dot is further away. 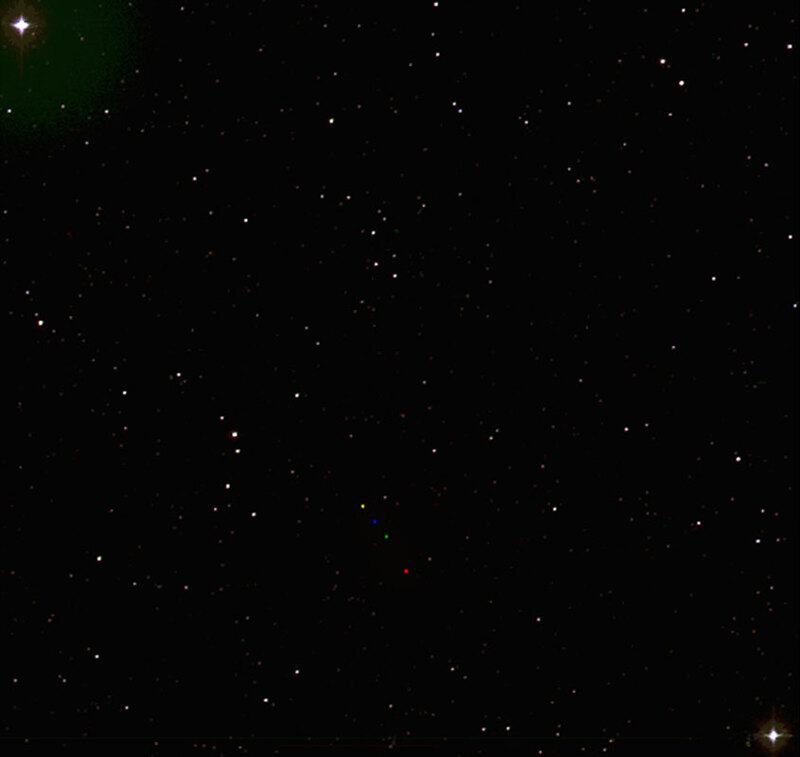 There would have been a spot between the red and green, but that night was cloudy, so no observation was made. If you look at the upper left and lower right corners, you will see two bright stars, which helped to find the field in each of the images. I took three of the frames and pulled them into Photoshop, each in a different channel. When the star images lined up, they appeared white, but the object that was different on each of the frames (Pluto), appeared as a red, green and blue dot from the object's image in each of the channels. The fourth image was stacked (as a greyscale) over the combined image from above. The two images were added, and the fourth image of Pluto was hand-colored yellow. As a big time Pluto fan, I love it!